TWSBI Eco Fountain Pen Review – Pens! Paper! Pencils! TWSBI spent a long time developing the Eco, apparently to ensure if didn’t suffer from the fragility that has plagued earlier models. Time will tell if they’ve been successful but in the meantime, what is this pen like? Was it worth the wait? Thank you to Pure Pens for sending me this pen to review. 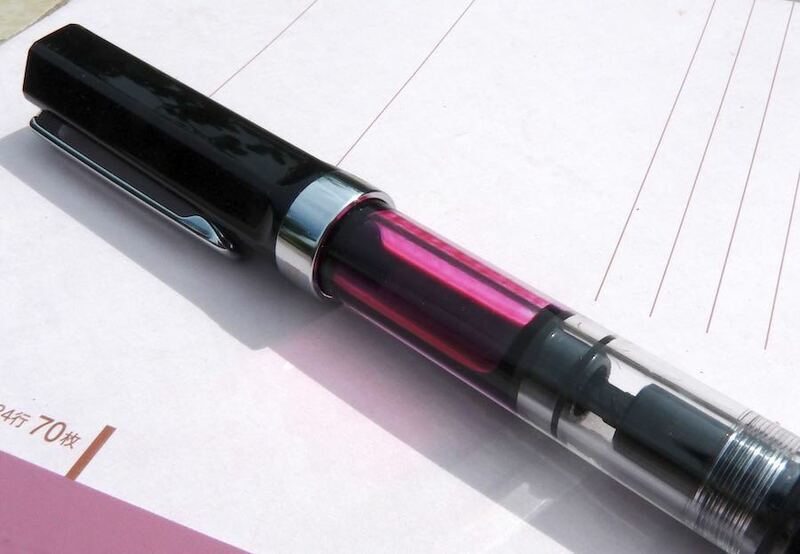 The barrel and section of the Eco are made from a single piece of clear plastic, apparently so TWSBI can make the pen robust while keeping costs down. Therefore the grip is simple and made from smooth hard plastic. It’s slim enough to be comfortable, though, and the threads for the cap are high enough not to be any bother. There’s a triangular shape to the very end of the section which gently guides your fingers into a proper grip without being intrusive. The cap is large, with a functional but ugly looking clip, and a red TWSBI logo on the end. It’s got a hexagonal cross-section, referencing to the Diamond range, in contrast to the round barrel. The piston nob is also black and hexagonal. 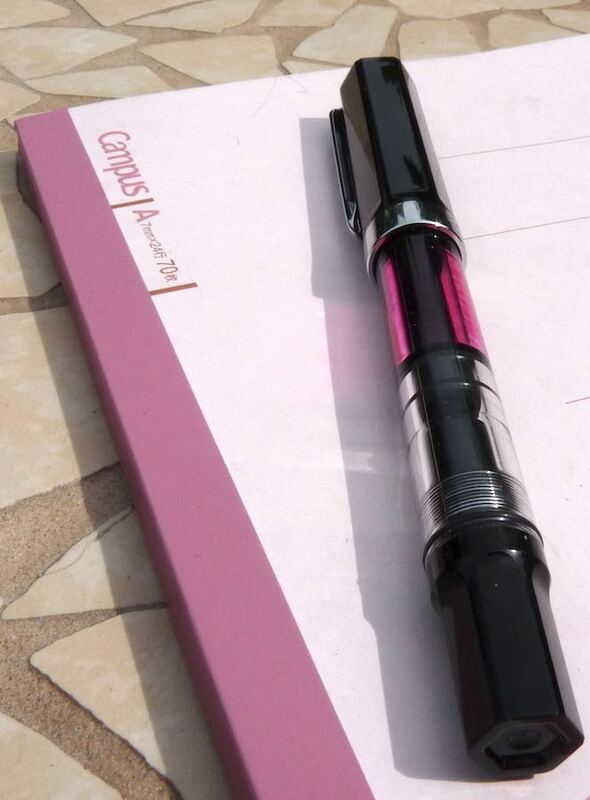 The cap does post, quite securely, and although it changes the balance of the pen it’s not too noticeable. It’s a light pen and a good length and I found it (with my big hands) comfortable to use posted or not. I’ve seen some people saying they find it unusable when posted so if posting is important to you and you don’t have big gorilla hands like me then you may want to try it out first. It’s unusual, to say the least, to find pens at this price point that are piston fillers. As far as I know, only Noodler’s do it. 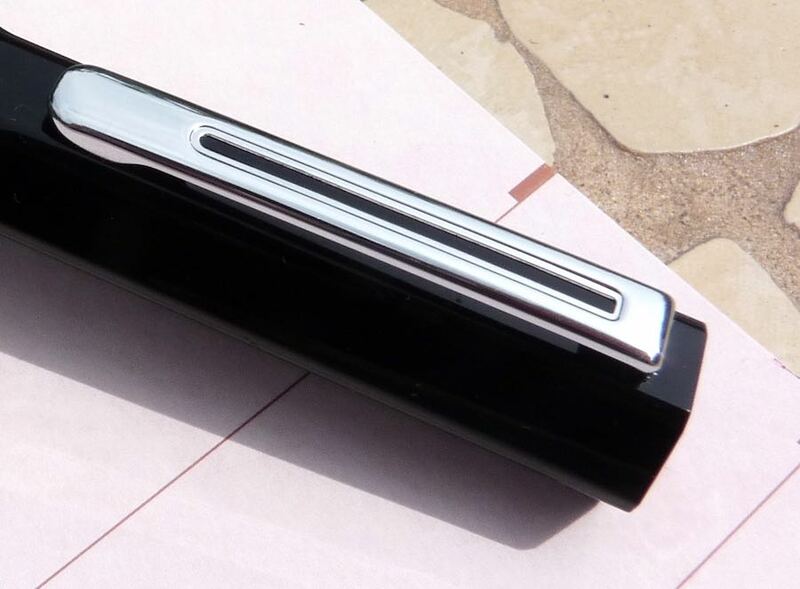 The mechanism on the Eco is smooth and enables the pen to hold a large amount of ink. 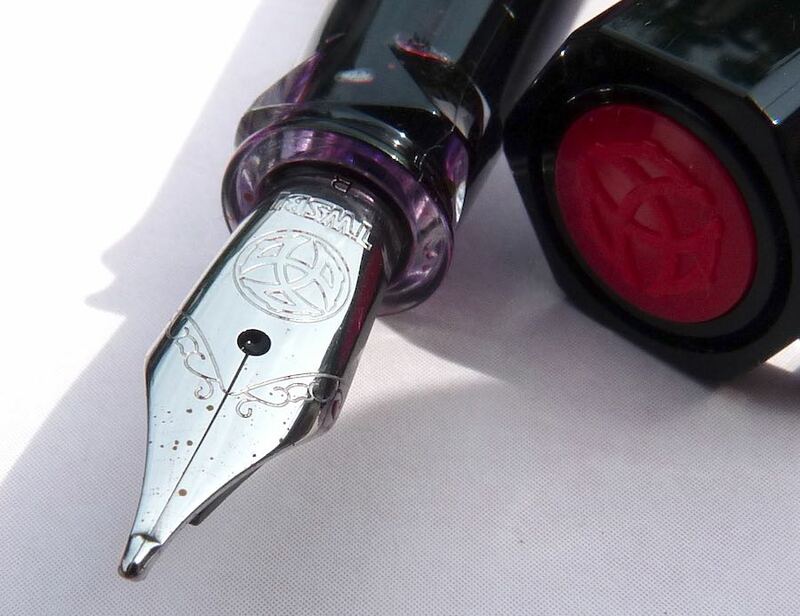 It does require some maintenance over time, and TWSBI include a plastic spanner and some silicon gel, so the piston can be removed and lubricated when needed. This, I can imagine, may put some new users off but it’s easy enough to do and doesn’t need to be done very often. The broad steel nib on my pen is lovely. It’s smooth – not Faber-Castell buttery smooth but nonetheless very good. It’s also wet without running away from you. If I’d bought a $100 pen with this nib, I would have been very happy. Put next to a Diamond 580, you can see that this is a cheaper pen. The clip, in particular, is obviously of lower quality, and there’s no metal trim. Taste is subjective – I’ve seen some people saying they hate how the Eco looks – but I think the Eco looks great. I always love to see ink sloshing about in a clear barrel and I really love how the ink looks in the feed in this pen. The cap looks great, with the red logo contrasting nicely against the black. It’s only the clip that I find ugly. Overall, whilst not the most beautiful pen in my collection, it’s not one you feel you need to use only at home with the curtains drawn and the lights switched off. This is a lovely pen to write with. The nib is great and the pen is comfortable to hold. Eco stands for economical and this is certainly a very attractively priced pen. Its also a very good pen that would be worth looking at even if it was significantly more expensive. Messing about with silicon gel (for greasing the piston) and bottles of ink mean this isn’t the ideal first fountain pen but it makes for a wonderful second pen. 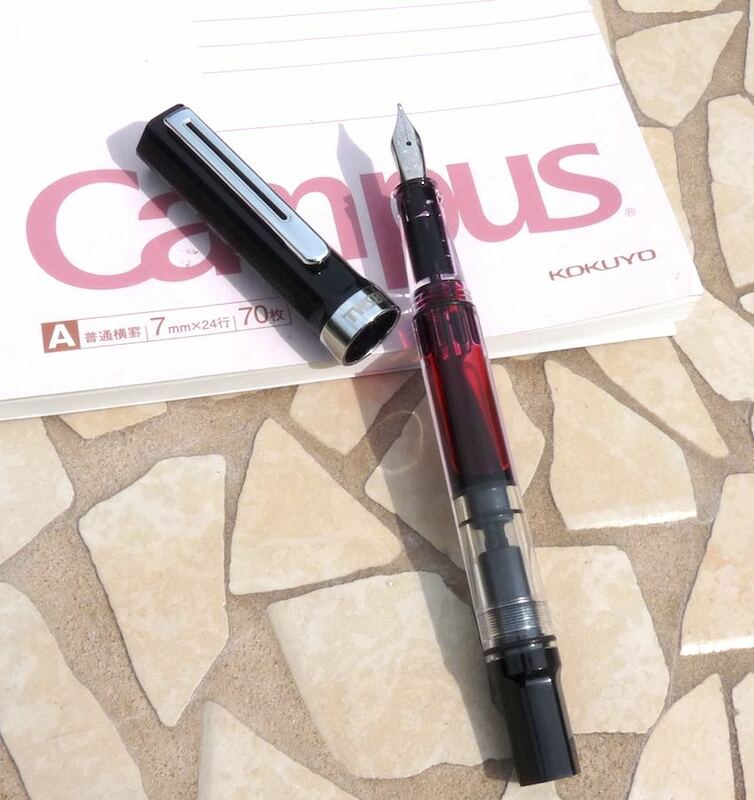 TWSBI have a winner on their hands. Many thanks to Pure Pens for sending me this pen to review. These are my own opinions. 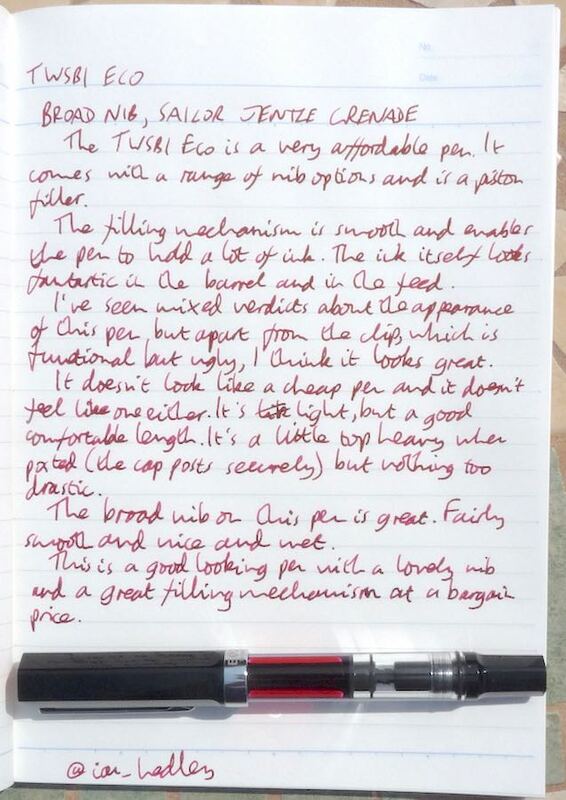 You can find some more reviews of the TWSBI Eco on Pennaquod. That seems like a fair review. I wonder about the pricing of it (for we UK pen people, anyway). £29, to me, pushes it out of “Eco” territory (it would be almost an impulse purchase at £20, say). I agree and I wonder if TWSBI are perhaps being a little unfair to us. But then £5 of that price is VAT, which no-one can do anything about. Why is a cons the need for maintenance? All pens need maintenance. All piston fillers will need some silicon grease from time to time. TSWBI is de only one who supplies the tool and the grease. I will say is a pro. My Twsbi 580 has more than two years and no wrench needed. My point was that all cars need eventually a tire replacement I find a Pro if the car includes the proper tools to service it.